We appreciate your comments and feedback. The following is a wonderful review from a recent client. We appreciate your comments and feedback. The following are wonderful reviews from recent clients. I met Shawn Price by chance during one of his trips to California. As a new German Shepherd dog owner, I needed more than book knowledge to train my puppy. Shawn guided me in every step of the way and, to this day, has been a great resource. There was gentleness behind each command, which I believe is key to effective training & relationship with your pet. 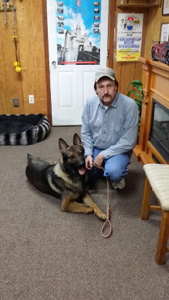 I was very impressed by how much I learned and how effective Shawn's work was with my GSD. I just wanted to thank you for all the work you and Shawn put into Bodo. He is a great dog, smart and a wonderful personal protection dog. I just wish my 2 daughters listened as well. The best part is knowing the family is safe and the home is secure. Learned a lot working with you and Shawn. Ever since I can remember, I have dreamed of training. Thanks to Bill & Shawn, this dream is now becoming a reality. It would be impossible to find anyone with more experience and knowledge than these two! They are able to impart their knowledge in a way that makes sense during each lesson. Not only am I learning valuable information but they make it so fun that I look forward to every training session! I also could not ask for a better dog than Nino whom I purchased from Estate Dogs. As I live alone, he not only makes a great and loving addition to my home, but provides the comfort and protection as well. Thanks Bill and Shawn for all you do! I look forward to continuing to learn from you both! I had been looking for a German Shepherd puppy for several months, when my husband surprised me with an adult male German Shepherd from Estate Dogs. His name is Huck and he has been a wonderful addition to our family. 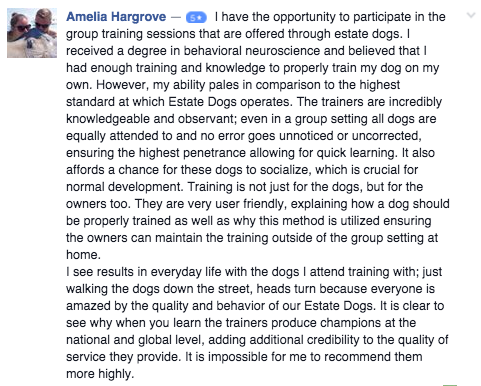 Him and I have continued training through Estate Dogs and I am very pleased with his progress. 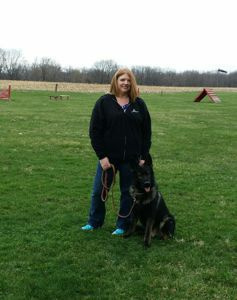 Bill & Shawn are excellent trainers and teachers and have been very patient with me while I'm learning with Huck. They don't make me feel like just another client, but more like a friend. I am enjoying each training session & feel like Huck and I have a closer bond because we train together. Thanks. Very impressed with the training methods used by this wonderful company! Despite having a traditionally stubborn breed, our English Bulldog, Herschel, is learning to be obedient both on and off leash. He improves and learns more every week and I can't wait to begin training our other bully puppies at Estate Dogs! I bought a personal protection dog and it is the best trained dog you will ever see, I am very happy with the German shepherd that I have. I really have to thank Bill & Shawn , they really do a great job training these dogs. And I learned a lot. I not only learned a great deal about training my puppy, I learned even more about myself because of this experience. Thank you! The best trained dogs I've ever has the privilege of owning. Nothing but the best of memories. 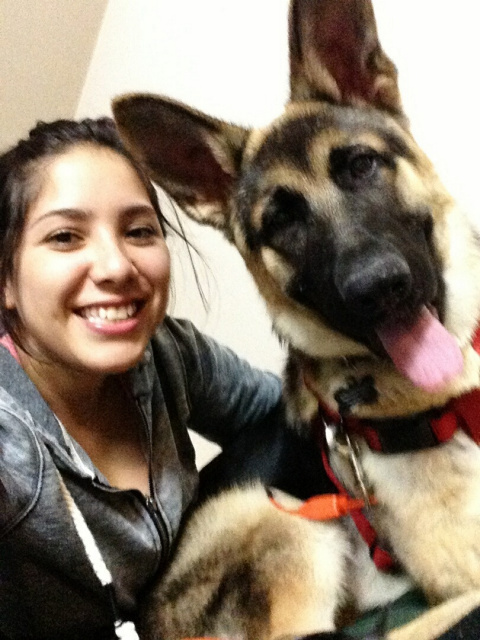 I have always dreamed of owning my own kennel and breeding German Shepherds. I want to thank you for giving me that opportunity through your workshop. Your workshop has given me the tools I needed to breed and train dogs as I had always wanted. I was very impressed with the amount of one on one training I received in your workshop, your experience and knowledge in the dog world I consider to be invaluable. I know feel confident that my kennel I have started here in Florida will be successful due to Estate Dogs. Thank you again. 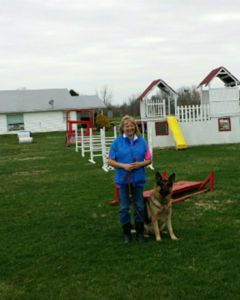 Lori Thaxton with one of the dogs she is working. The workshop is hands on training. I have wanted train and breed German Shepherds all of my life thanks to your "A to Z" full-scale workshop I'm living the dream! There are no words to express the depth of what I have learned by taking your classes! I'm on my way to starting my own business here in California, having sold a litter of pups to signing up the new owners for puppy classes as well as basic and advanced obedience training. The workshop was an absolutely amazing experience. Your training methods and the incredible amounts of information that you taught me I will always treasure! Not only did I gain a priceless "dog education", I gained a very dear and valued friendship! Thank you Bill, look forward to seeing you in the future! I began working with Bill Price under the tutelage of his Estate Dog Training workshop. 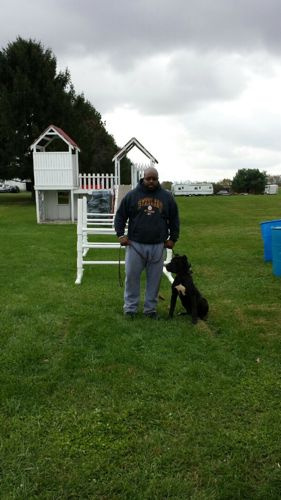 It has taken my understanding of dog training and expanded my knowledge of K-9 behavior, as well as provided me with many proven training methods. 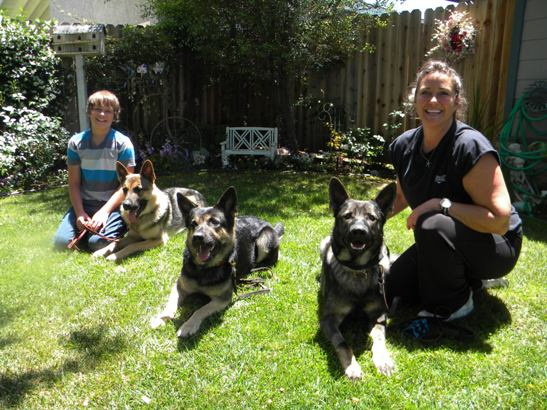 These methods allow me to expand my dog breeding and high-level K-9 training to be able to provide my services to families and businesses as a complete protection and training program.